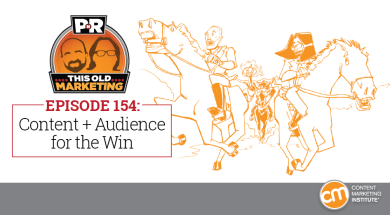 In this episode, Robert and I discuss the proposed merger of AT&T and Time Warner and what it might mean for marketers. We also take a look at how email is becoming more important than ever and dissect the latest APAC content marketing research. Our rants and raves include a new content book and our sympathies for poor, poor Mashable; then we wrap up with an example of the week from Pinsent Masons. Noosh: Each year we cull through thousands of Content Marketing projects to gather useful insights about costs, collaboration, vendor management, and more. We’ve analyzed more than 175,000 projects from companies around the world to summarize things like the average cost of a project, number of team members, time to complete, etc. Download your copy of this essential benchmark now to see how your company compares to averages around the world! Get the Content Marketing Benchmark Report. AT&T agrees to buy Time Warner for $85.4 billion (10:00): As reported in The New York Times (and just about every other media outlet on the planet), the telecommunications giant’s purchase of content kingpin Time Warner (the home of lucrative properties like HBO and CNN), would create a new colossus capable of both producing content and distributing it to millions of customers. While Robert remains skeptical that AT&T will actually be able to execute on a content + distribution opportunity like this in a meaningful way, he does believe it hastens the need for product companies and agencies to get into the media business. Survey shows email is making a strong resurgence (21:04): A new Adobe Digital Insights report has found that, not only is email evolving to survive in a text-and-emoji-obsessed world, it’s actually thriving. As discussed in an article on cmo.com, time spent with email is up 17%, year over year, partly due to the rising use of smartphones, which make email more accessible throughout the day. Though we felt some of the stats could be open to interpretation, we applaud the ambitions of this research, given that email is such an important mechanism for building an audience of subscribers. Are APAC marketers adequately informed about content marketing? (28:17): A recent survey report by HubSpot and SurveyMonkey aims to provide marketers across the Asia-Pacific region with a data-backed summary of current trends in content marketing. However, an analysis published on LinkedIn by King Content Singapore’s head of content questions whether survey respondents truly understand the purpose and processes involved in the technique. In our experience, most marketers lack a clear, complete understanding of content marketing — not just those in the APAC region. But we do share the author’s concerns about other parts of the study. Curalate: The Complete Guide to Visual Commerce. Which three obstacles keep marketers up at night? By now, you probably know that discovery and purchases are driven by lifestyle content. How can you minimize clicks between the lifestyle content consumers love and the products they want to buy? We’ve created a guide explaining how lifestyle content is changing the way commerce works. Learn how marketers and site managers can 1) find more creative, 2) identify top performers and 3) connect lifestyle content to product conversions. Download the guide now. Robert’s “quick commentary” No. 1: Harvard Business Review talks about a new book, The Content Trap, by Bharat Anand, which contends that digital strategy needs to shift focus from “produce the best content” to “create the best connections.” While he can’t really argue for (or against) the overall premise, Robert isn’t quite convinced that the author has offered sufficient proof to support his conclusions. Robert’s “quick commentary” No. 2: In a recent blog post, new-media advocate Thomas Baekdal takes a hard look at how the media frequently cites YouTube views as being the online equivalent of TV ratings. For the most part, Robert agrees with Baekdal’s assertions, but he feels that, in analyzing the relative merits of the two formats, ad buyers need new measurements that will help them distinguish the value of media that is bought vs. media that’s delivered. Joe’s rant: Mashable covers the news that Chipotle is launching a Snapchat show, called School of Guac. While I don’t have much to say about the creative effort itself, the Mashable article totally made my head spin, due to all the pop-ups, pop-overs, scrolling ads, and other annoying distractions that make the reading experience completely unusable. Joe’s rave No. 1: Clothing retailer GAP has come out with a really interesting new magazine called Document, which was recently profiled on magCulture. I encourage everyone to explore this well-conceived print effort — particularly its coverage of the history of fashion trends related to the GAP brand. Joe’s rave No. 2: This Recode post shared breaking news that The New York Times is purchasing The Wirecutter. The 5-year-old gadgets-and-electronics guide was founded by a former editor at Gizmodo and is all affiliate-run — making it an interesting example of a publisher moving away from a completely advertising-based revenue model. In preparation for an upcoming webinar Robert is producing for Lawyers Marketing Association, he came across a Content Marketing Today case study on a wonderful piece of content, which just happens to have been highlighted in my first book, Get Content Get Customers. U.K. law firm Pinsent Masons created a content marketing brand called Out-Law, aimed at making British law firms seem more contemporary and accessible in the eyes of its current and potential technology law clients. 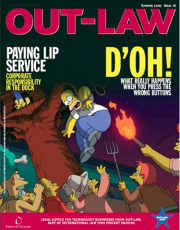 Simultaneously launched in print and online, (though only the online version remains today), the initiative’s somewhat edgy name was chosen to evoke images of the American Wild West, to suggest the idea of outside-the-box thinking from a legal perspective. The case study article refers to the effort as “an enjoyable business publication that just happens to cover topics about technology law,” which makes it an excellent This Old Marketing example of how content can really help companies differentiate themselves in the marketplace.